Given the proliferation of laptops, tablets, and smartphones, many people no longer expect to sit at a desk to get work done. If people are spending more time away from their office, then organizations need to reallocate square footage towards common spaces to drive cost efficiencies and improve the ROI of their real estate. Fortunately, many organizations are already embracing the shift to less formal, more collaborative-focused workplace environments by building out smaller, more informal meeting spaces frequently called huddle spaces. The many benefits of huddle spaces are appealing to employers, but the most significant advantage could be their positive impact on the bottom line. Huddle spaces can help decrease your business’ operational costs. Large conference rooms are often equipped with sophisticated AV equipment that can be confusing and, therefore, rarely used. These capital investments can cost upwards of $100,000 – a substantial investment even for financially successful companies – but often deliver little value in terms of ROI. In contrast, huddle spaces can be equipped with sleek, simple-to-use collaboration tools that are easy to use and cost a fraction of conventional AV tools. Our wireless collaboration system, Solstice, is an excellent option for outfitting huddle and transition spaces. Huddle spaces encourage a culture of collaboration which can lead to more spontaneous brainstorming and problem solving among your team. That kind of teamwork isn’t just good for your culture; it’s good for your bottom line. It allows employees to use more fluid discussions to gain new perspectives and work quickly to innovate. That’s good news for your organization and great news for employee morale. The key is to make the huddle space adaptable, comfortable, and as easy-to-use as possible. There are a variety of huddle space types, too, so make sure you create the one that’s right for your team and your space. Mersive understands the way that offices and organizations operate is changing. We want to help your company be at the forefront of those changes with the right collaborative technology. 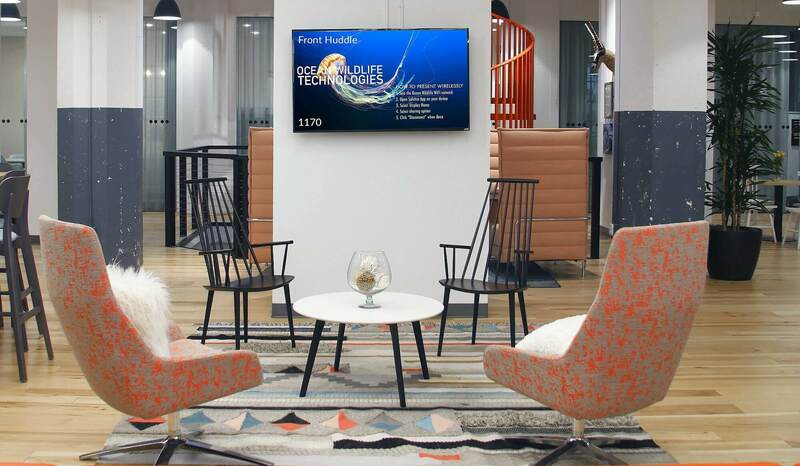 We’re an industry leader in huddle room technology, providing high-quality, easy-to-use equipment that integrates seamlessly into your workspace.